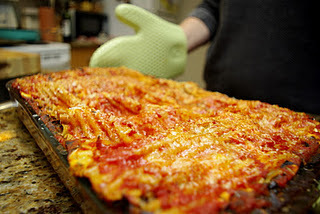 This lasagna is a great way to feed a family and satisfy everyone (meat eaters included). However, I know some of you are thinking veggie lasagna is boring, lacks a rich flavour or that all the veggies fall out once it is cut and served. To avoid all the prior I have combine chopped spinach and marinated artichokes directly into the sauce, doing this imparts great flavour to the sauce and makes assembly much quicker as you are not spending time layering vegetables in addition to the noodles and cheese. The other great thing about this recipe is that you can keep most ingredients on hand in the pantry, only having to shop for a couple items like ricotta and fresh herbs, which makes this easy to whip up on short notice (perhaps family or friends dropping in for a weeknight dinner)! Preheat oven to 350 degrees F and grease a 9x13" baking dish. In a large saute pan over medium heat saute, onion, garlic, spinach, artichokes, basil, oregano and red pepper flakes in the olive oil. Add in 1 1/2 jars pasta sauce and water and simmer 10 minutes. In a large bowl mix mozzarella cheese, ricotta cheese, Parmesan cheese, parsley, salt, pepper and egg. Set aside. Place a 1/2 of reserved plain sauce (1/4 jar) in the bottom of a baking dish. Place layer of uncooked noodles on top of sauce and top with thin layer of spinach sauce. Add layer of noodles and layer with 1/2 spinach sauce followed by 1/2 cheese mixture then layer on all sliced roasted red peppers, add another layer of noodles and repeat with remaining spinach sauce and cheese. Last layer with noodles and top with rest of reserved plain sauce. Cover with foil and bake in a preheated oven for 55 minutes. After 55 minutes, remove foil sprinkle with extra Parmesan and bake another 10 minutes. Let sit 10 minutes before serving. Wow, this looks delicious! 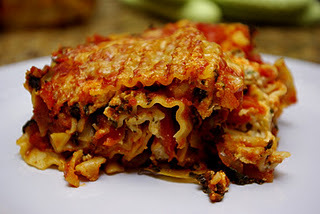 I love a good veggie lasagna and love the addition of the artichokes and roasted red peppers. New follower. Nice to see you joined foodbuzz. It's a great group of people on there. Very supportive bunch. This dish is making me so hungry. I'd have to omit the spinach but otherwise it's perfection. I swear I could lasagna almost every day and never get sick of it. That and pizza. Hope you have a wonderful weekend. Hi KimBee. Thanks for the comment, I hope you have a chance to give it a try...let me know how it goes without the spinach. Maybe you could sub in another type of green?! ?